The Department of Foreign Affairs (DFA) is at present recruiting candidates for the position of Foreign Service Officer (FSO) Class IV in 2019. Bachelor's Degree in Electronics & Communications Engineering (Fresh graduates are welcome to apply), For non BS Electronics & Communications Engineering graduates, at least 2 years' experience as a plant technician in a cable company. Unafraid of height and enclosed spaces. Willing to work in varied shifts. Those interested to apply. Please send your resume to Sky Talent Acquisition Manager, Ms. Erika dela Cruz at ESDelaCruz@skycable.com. Alorica is worldwide leader in Business Outsourcing solutions that span the entire customer lifecycle. The Philippines has consistently proven to be an exceptional location for the outsourcing industry. High proficiency in English, an educated workforce, robust and reliable technology infrastructure and lower operational costs all contribute to the nation's reputation as a market leader. Alorica plays a major role in community development, particularly in the area of education; the company helps to provide the resources schools need to improve student performance and better prepare youngsters for technology-driven economy, and deserving students are sent to school by scholarships sponsored by Alorica. With more than 32,000 employees in 18 sites, Alorica boasts of large Philippine presence in Metro Manila, Batangas Clark, Cebu, Davao, and Ilocos servicing industry sectors including automotive, technology, healthcare & insurance, retails & e-commerce, financial services, media & entertainment, travel & transporation. In line with this, we will be conducting Special Recruitment Activity on September 20, 2017 at 3rd Floor Mall of the Valley, Centro Tuguegarao City from 9AM to 2PM. Anent to this; we would like to request a list of applicants who are looking for a job that we can invite to the said SRA. 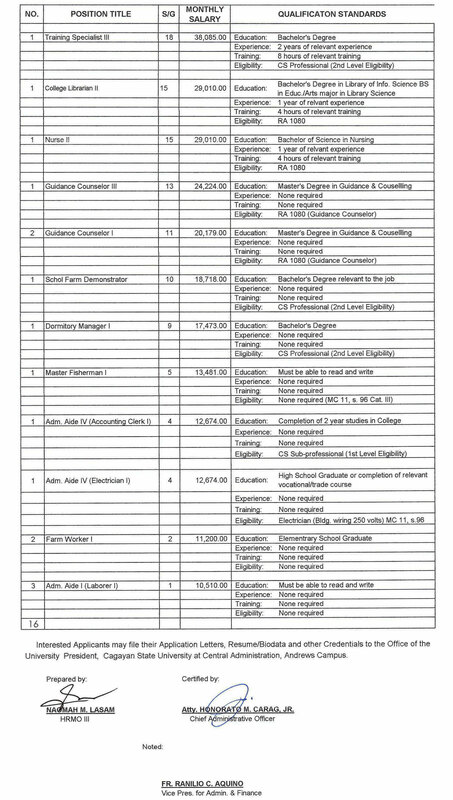 Please see attached files for Alorica's government documents and job openings. We fervently hope that you can accomodate us in this endeavor. We are hoping for your positive response on this request. Thank you! The Department of Foreign Affairs (DFA) is at present recruiting candidates for appointment to the position of Foreign Service Officer (FSO) Class IV. 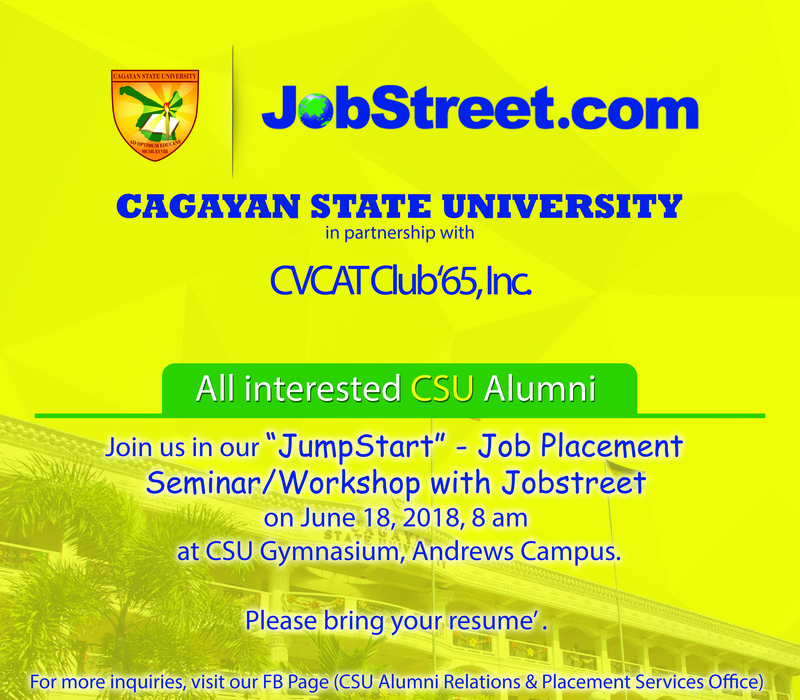 In this connection, their Board of Foreign Service Examinations (BFSE) invites CSU Alumni who are interested in a career in public service to take the 2018 Foreign Service Officer Examinations. Interested applicants may submit their applications to the BFSE Secretariat until 08 December 2017, or to Regional Consular Offices, and Philippine Embassies and Consulates abroad until 01 December 2017. The Qualifying Test will be held on 28 January 2018 at designated testing centers all over the country. The schedule for subsequent tests will be announced accordingly. Interested applicants may submit their applications to the BFSE Secretariat until 08 December 2017, or to Regional Consular Offices, and Philippine Embassies and Consulates abroad until 01 December 2017. The Qualifying Test will be held on 28 January 2018 at designated testing centers all over the country. The schedule for subsequent tests will be announced accordingly. The FSO Examinations are designed to evaluate the applicants' knowledge on Philippine economic, political, and social conditions; facility in oral and written communications; and ability to perform the duties of a Foreign Service Officer. The exams comprise five parts, namely: the qualifying test, preliminary interview, written test, psychological tests and oral test. Foreign Service Officers are in charge of promoting and protecting the interests of the Philippines and the Filipino people, at home and at 85 posts overseas. The duties of a FSO IV include: drafting reports, correspondences, position papers, talking points, legal opinions or agreements, attending local and international meetings and conferences, coordinating with government agencies and diplomatic missions on matters pertaining to the mandate of his/ her division; handling assistance-to-nationals cases; and supervision of staff at the Home Office and Posts. For further information, interested applicants may call the BFSE Secretariat at 834-3080; 834-4925; email bfse@dfa.gov.ph or check https://dfa.gov.ph/fsoexams. All the details above-mentioned were provided by DF A Board Secretary Claro S. Cristobal. Please be guided accordingly. Thank you and God bless us all! Hytec Power, Inc. is seeking our assistance for their recruitment program for employment opportunity of our graduates to apply as Field Application Engineers/Executives and Product Specalists in the following fields: Marketing, Agricultural Engineering, Electrical/Electronics Engineering/ Technology, Mechanical Engineering/Technology, Computer Engineering and Industrial Engineering. 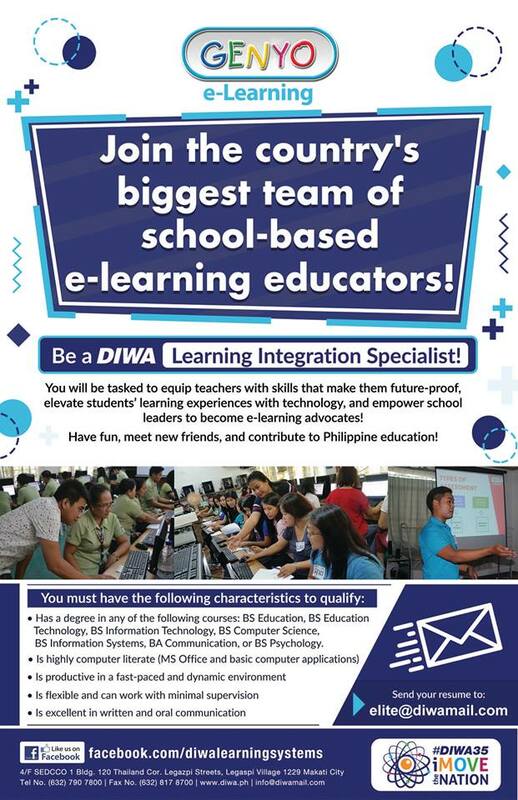 willing to be assigned within the provinces of Cagayan Isabela, Nueva Viscaya, Quirino, Ifugao, Kalinga, Apayao, and Mountain Province. Company Incentives are transporation and phone allowance, incentives available for performers and career advancement. Salary is based on Manila Rates. Applicants may or may not necessarily be board passers. Application letters should be sent through email to hr3@hytectpower.com or hr2@hytecpower.com. For more information about the company, please log on to www.hytec.powerinc.